Rich, chocolaty, easy-to-make and yummy… I’m thrilled to have found this cupcake recipe and to be sharing it with you. 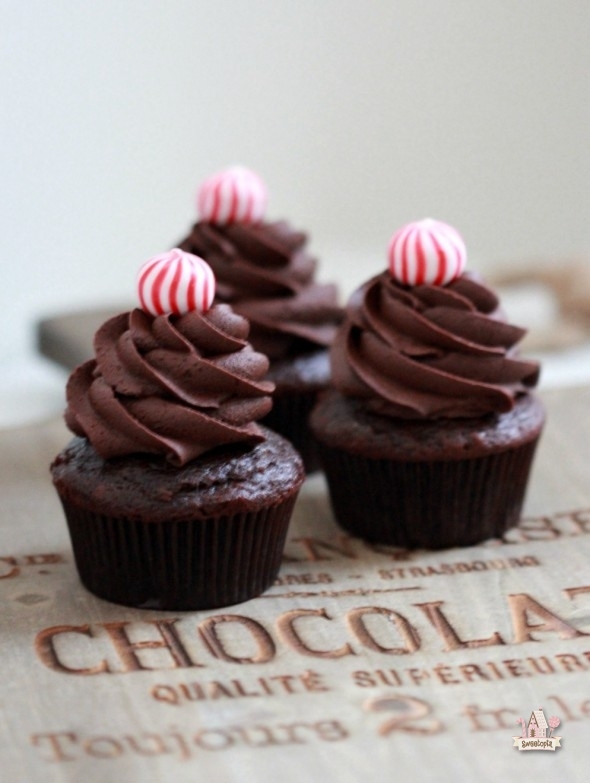 Truly decadent, these classic chocolate cupcakes have become my go-to favorite. Normally I would have baked oodles of experimentation batches to have arrived at the place where I’d be ready to share a recipe with you, but in this case I was approached by Ricardo’s Cuisine to review his Best-Best Chocolate Cake Recipe, and I’m obviously happy to report that it was a win-win. Ricardo Cuisine is a recipe site jam-packed with tried and true savory and sweet recipes – Everything from holiday season classics to allergy-friendly recipes and vegetarian options. It’s a definite site to bookmark and visit for meal and dessert ideas, and don’t forget to check out Ricardo’s magazine for more drool-worthy and beautiful inspiration. Just a few bowls and mixing involved for the cupcakes, and the results are delicious. Ricardo’s cake calls for a ganache covering, which I piped into the center of the cupcake for a sweet surprise. 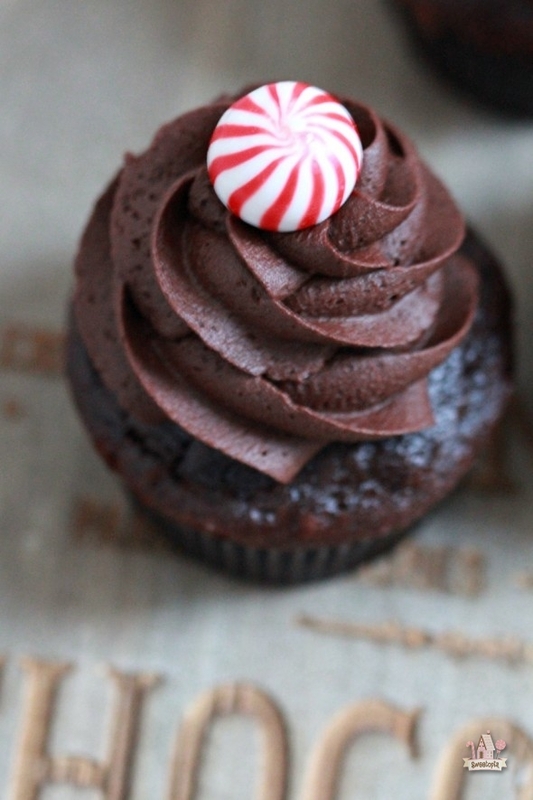 Topped with my easy chocolate frosting (recipe here), these cupcakes are sure to be a Christmas and any time crowd pleaser. Enjoy baking and eating sweet friends! With the rack in the middle position, preheat the oven to 180 °C (350 °F). Line your muffin tray with cupcake liners. In another bowl, combine eggs, sugar, buttermilk, oil and vanilla with a whisk. Set aside. 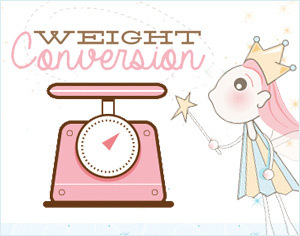 In a small bowl, combine cocoa powder and coffee with a whisk. Add to egg mixture. Add dry ingredients and stir until smooth. Spoon batter into cupcake liners (About 1/4 cup per liner). Bake for 15 minutes or until a toothpick inserted in the centre of the cupcake comes out clean. 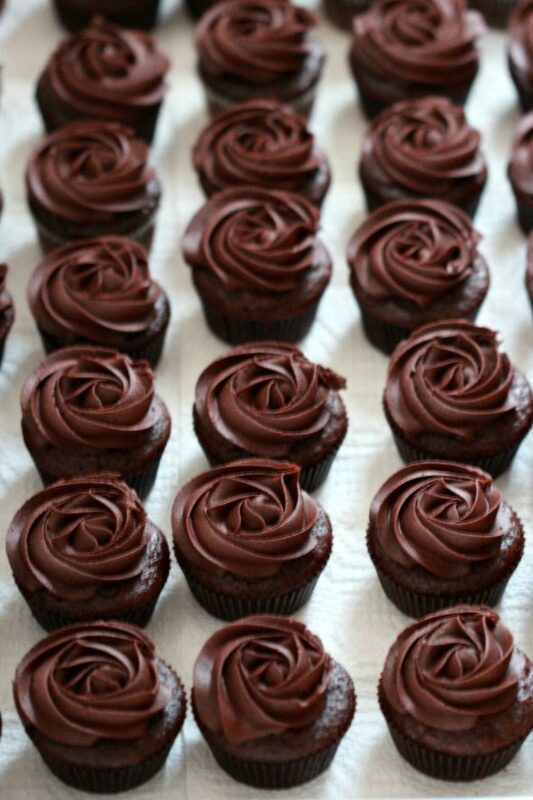 Let cool completely before filling the cupcake centers with ganache and topping with icing. Chocolate Icing Recipe can be found by clicking HERE. 16 oz (450 g) dark chocolate, chopped (Use the best quality chocolate you can). In a saucepan, bring cream and corn syrup to a boil. In a bowl, pour hot cream mixture over chocolate. Let melt for 2 minutes. Whisk until ganache is smooth. Refrigerate for about 1 hour or until it has thickened and is spreadable, stirring four or five times. For the ganache center of the cupcake, using a #10 piping tip or other piping tip of your choice, sink your piping tip into the top of the cooled cupcake to about the center, and squeeze out a dollop of icing. Stop squeezing and remove. Your cupcakes look delicious,and very attractive. 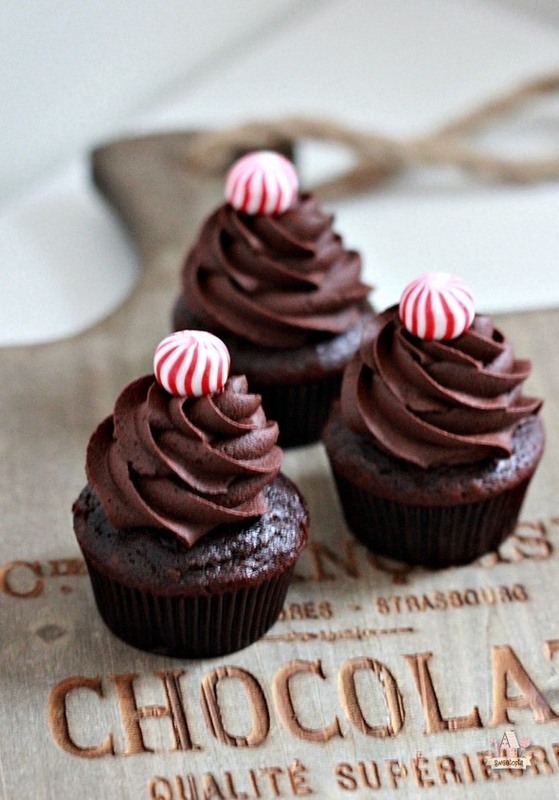 Perfect for chocolate lovers! those cuppies look so sooo delicious. I love both ways how you decorated them. The rose look is very festive. Everybody loves chocolate, I bet they were a huge hit. OMG…they look just TOO delicious! These look absolutely amazing. Sooooo love anything chocolate. Will be trying these really soon, as it is my sons birthday! Love everything Sweetopia! These cupcakes look decent but I love Dave more. Maybe Dave or these cupcakes could call me some day. You should make little icing mustaches for you cupcakes like Dave’s and maybe you would get more website hits. You are neat as well but just not as cool as Dave. O.K. Have fun baking things. 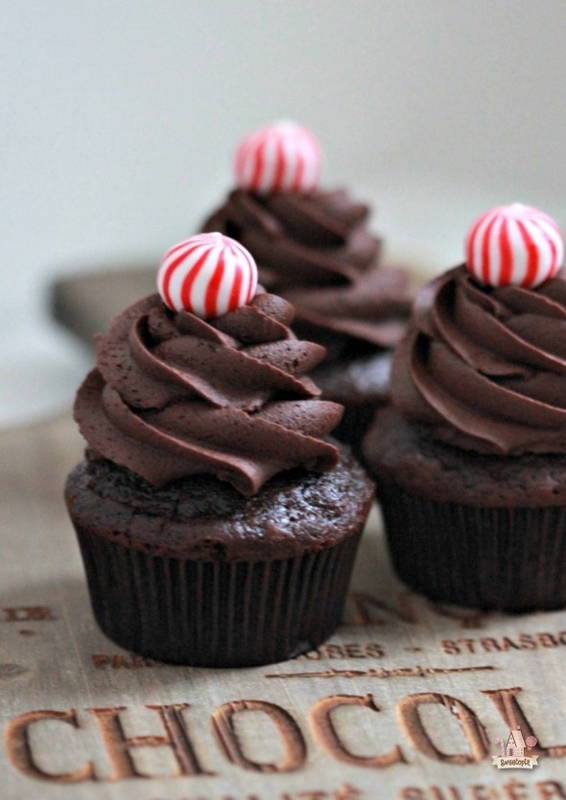 Love double chocolate cake and cupcakes. Will try. Looks awesome.